Dr Steven J. Murdoch is a Royal Society University Research Fellow in the Information Security Research Group of University College London, working on banking security, authentication and developing metrics for security and privacy. His research interests also include anonymous communications, censorship resistance and covert channels. He has worked with the OpenNet Initiative, investigating Internet censorship, and for the Tor Project, on improving the security and usability of the Tor anonymity system. He is Innovation Security Architect at OneSpan, an online security technology provider. Earlier this year, Shehar Bano summarised our work on scanning the Internet and categorising IP addresses based on how “alive” they appear to be when probed through different protocols. Today it was announced that the resulting paper won the Applied Networking Research Prize, awarded by the Internet Research Task Force “to recognize the best new ideas in networking and bring them to the IETF and IRTF”. This occasion seems like a good opportunity to recall what more can be learned from the dataset we collected, but which couldn’t be included in the paper itself. Specifically, I will look at the multi-dimensional aspects to “liveness” and how this can be represented through holographic visualisation. One of the most interesting uses of these experimental results was the study of correlations between responses to different combinations of network protocols. This application was only possible because the paper was the first to simultaneously scan multiple protocols and so give us confidence that the characteristics measured are properties of the hosts and the networks they are on, and not artefacts resulting from network disruption or changes in IP address allocation over time. These correlations are important because the combination of protocols responded to gives us richer information about the host itself when compared to the result of a scan of any one protocol. The results also let us infer what would likely be the result of a scan of one protocol, given the result of a scan of different ones. 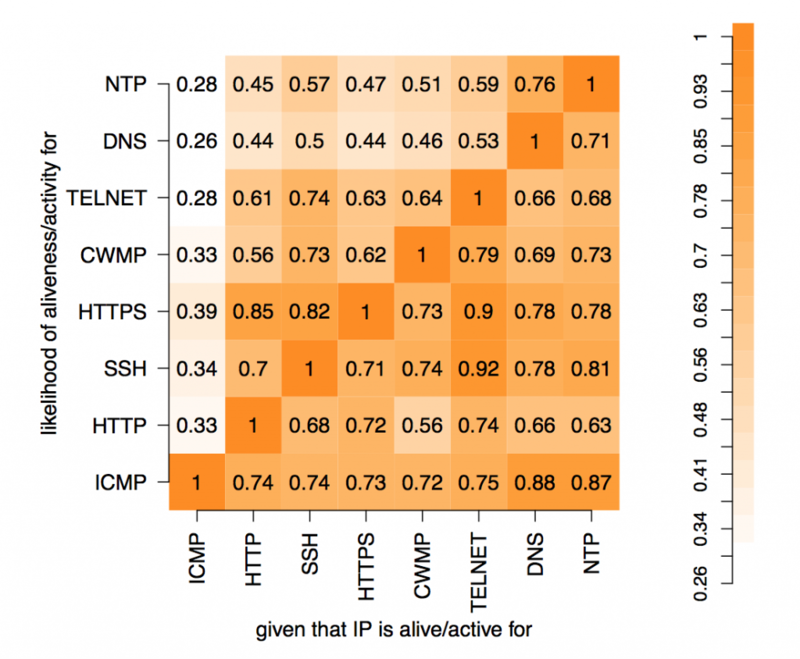 In these experiments, 8 protocols were studied: ICMP, HTTP, SSH, HTTPS, CWMP, Telnet, DNS and NTP. The results can be represented as 28=256 values placed in a 8-dimensional space with each dimension indicating whether a host did or did not respond to a probe of that protocol. Each value is the number of IP addresses that respond to that particular combination of network protocols. Abstractly, this makes perfect sense but representing an 8-d space on a 2-d screen creates problems. The paper dealt with this issue through dimensional reduction, by projecting the 8-d space on to a 2-d chart to show the likelihood of a positive response to a probe, given a positive response to probe on another single protocol. This chart is useful and easy to read but hides useful information present in the dataset. In London, this week, a trial is being held over a dispute between the Justice for Subpostmasters Alliance (JFSA) and the Post Office, but the result will have far-reaching repercussions for anyone disputing computer evidence. The trial currently focuses on whether the legal agreements and processes set up by the Post Office are a fair basis for managing its relationship with the subpostmasters who operate branches on its behalf. Later, the court will assess whether the fact that the Post Office computer system – Horizon – indicates that a subpostmaster is in debt to the Post Office is sufficient evidence for the subpostmaster to be indeed liable to repay the debt, even when the subpostmaster claims the accounts are incorrect due to computer error or fraud. Disputes over Horizon have led to subpostmasters being bankrupted, losing their homes, or even being jailed but these cases also echo the broader issues at the heart of the many phantom withdrawals disputes I see between a bank and its customers. Customers claim that money was taken from their accounts without their permission. The bank claims that their computer system shows that either the customer authorised the withdrawal or was grossly negligent and so the customer is liable. The customer may also claim that the bank’s handling of the dispute is poor and the contract with the bank protects the bank’s interests more than that of the customer so is an unfair basis for managing disputes. There are several lessons the Post Office trial will have for the victims of phantom withdrawals, particularly for cases of push payment fraud, but in this post, I’m going to explore why these issues are being dealt with first in a trial initiated by subpostmasters and not by the (far more numerous) bank customers. In later posts, I’ll look more into the specific details that are being disclosed as a result of this trial. Banking transactions are rapidly moving online, offering convenience to customers and allowing banks to close branches and re-focus on marketing more profitable financial products. At the same time, new payment methods, like the UK’s Faster Payment System, make transactions irrevocable within hours, not days, and so let recipients make use of funds immediately. However, these changes have also created a new opportunity for fraud schemes that trick victims into performing a transaction under false pretences. For example, a criminal might call a bank customer, tell them that their account has been compromised, and help them to transfer money to a supposedly safe account that is actually under the criminal’s control. Losses in the UK from this type of fraud were £145.4 million during the first half of 2018 but importantly for the public, such frauds fall outside of existing consumer protection rules, leaving the customer liable for sometimes life-changing amounts. The human cost behind this epidemic has persuaded regulators to do more to protect customers and create incentives for banks to do a better job at preventing the fraud. These measures are coming sooner than UK Finance – the trade association for UK based banking payments and cards businesses – would like, but during questioning by the House of Commons Treasury Committee, their Chief Executive conceded that change is coming. They now focus on who will reimburse customers who have been defrauded through no fault of their own. Who picks up the bill will depend not just on how good fraud prevention measures are, but how effectively banks can demonstrate this fact. One factor that contributed to the new type of fraud is that online interactions lack the usual cues that help customers tell whether a bank is genuine. Criminals use sophisticated social engineering attacks that create a sense of urgency, combined with information gathered about the customer through illicit means, to convince even diligent victims that it could only be their own bank calling. These techniques, combined with the newly irrevocable payment system, create an ideal situation for criminals. Despite its international context, discussion of the social implications of technology is surprisingly parochial. For example, the idea that individuals should have control over how their data is used is considered radical and innovative in the US, despite it being commonly accepted in Europe since the early 1980’s. The same applies to including professional and ethical training as part of computer science curricula – while a recent move in many US institutions, it’s been mandatory for BCS accredited courses in the UK for as long as I can remember. One lesson that comes from the UK’s experience here, and that I think would be of help to institutions following its lead, is that students being aware of ethics is not enough to protect society and individuals. There needs to also be strong codes of conduct, built on ethical principles, which practitioners are expected to follow. For most computer science practitioners in the UK, the codes of conduct of relevance are from the field’s professional bodies – BCS and IET. They say roughly what you might expect – do a good job, follow instructions, avoid conflicts of interest, and consider the public interest. I’ve always found these to be a bit unsatisfactory, treating ethical decisions as the uncontroversial product of the application of consistent rules of professional conduct. These rules however don’t help with reality, where practitioners are faced with decisions where all options come at substantial personal or financial cost, where rules are inconsistent with themselves and ethical principles, all while faced with substantial uncertainty as to the consequences of their actions. That’s why I am pleased to see that the ACM ethical code released today goes some way to acknowledge the complex interaction between technology and society, and provides tools to help practitioners navigate the challenges. In particular it gives some guidance on a topic I have long felt sorely lacking in the BCS and IET codes – what to do when instructions from your employer conflict with the public interest. At best, the BCS and IET codes are silent on how to handle such situations – if anything the BCS code puts emphasis on acting “in accordance” with employer instructions compared to requiring that members only “have due regard” for the public interest. In contrast, the ACM code is clear “that the public good is the paramount consideration”. The ACM code also is clear that ethical practices are the responsibility of all. Management should enact rules that require ethical practices – they “should pursue clearly defined organizational policies that are consistent with the Code and effectively communicate them to relevant stakeholders. In addition, leaders should encourage and reward compliance with those policies, and take appropriate action when policies are violated.” But also, the code puts the duty on employees, through individual or collective action, to follow ethical practices even if management has not discharged their duty – “rules that are judged unethical should be challenged”. Courses of action discussed in the ACM code are not limited to just challenging rules, but also actively disrupting unethical practices – “consider challenging the rule through existing channels before violating the rule. A computing professional who decides to violate a rule because it is unethical, or for any other reason, must consider potential consequences and accept responsibility for that action”. One specific example of such disruptive action is whistleblowing, which the code recognizes as a legitimate course of action in the right circumstances – “if leaders do not act to curtail or mitigate such risks, it may be necessary to ‘blow the whistle’ to reduce potential harm”. However, my one disappointment in the code is that such disclosures are restricted to being made only through the “appropriate authorities” even though such authorities are often ineffective at instituting organizational change or protecting whistleblowers. Implementing ethical policies is not without cost, and when doing so runs against business opportunities, profit often wins. It is nevertheless helpful that the code suggests that “in cases where misuse or harm are predictable or unavoidable, the best option may be to not implement the system”. The UK banks currently saying they can’t prevent push-payment fraud, resulting in life-changing losses to their customers, would do well to consider this principle. The current situation, where customers are held liable despite taking a normal level of care, is not an ethical practice. Overall, I think this code is helpful and I am impressed at the breadth and depth of thought that clearly went into it. The code is also timely, as practitioners are now discovering their power to disrupt unethical practices through collective action and could take advantage of being given the permission to do so. The next task will be how to support and encourage the adoption of ethical principles and counteract the powerful forces that run into conflict with their practice. Will new UK rules reduce the harm of push-payment fraud? On Friday’s Rip off Britain I’ll be talking about new attempts by UK banks to prevent fraud, and the upcoming scheme for reimbursing the victims. While these developments have the potential to better protect customers, the changes could equally leave customers in a more vulnerable situation than before. What will decide between these two extremes is how well designed will be the rules surrounding these new schemes. The beginning of this story is September 2016, when the consumer association – Which? – submitted a super-complaint to the UK Payment System Regulator (PSR) regarding push payment fraud – where a customer is tricked into transferring money into a criminal’s account. Such bank transfers are known as push payments because they are initiated by the bank sending the money, as opposed to pull payments, like credit and debit cards, where it is the receiving bank that starts the process. Banks claim that since the customer was involved in the process, they “authorised” the transaction, and so under UK and EU law, the customer is not entitled to a refund. I’ve argued that this interpretation doesn’t match any reasonable definition of the word “authorised” but nevertheless the term “authorised push payment scams” seems to have stuck as the commonly used terminology for this type of fraud, I’m sure much to the banks’ delight. The Which? super-complaint asked for banks to be held liable for such frauds, and so reimburse the victims unless the bank can demonstrate the customer has acted with gross negligence. Which? argued that this approach would protect the customers from a fraud that exists as a consequence of bank design decisions, and provides banks with both a short-term incentive to prevent frauds that they can stop, as well as a medium-to-long term incentive for the banks to enhance payment systems to be resistant to fraud. The response from the PSR was disappointing, recognising that banks should do more, but rejecting the recommendation to hold banks liable for this fraud and requesting only that the banks collect more data. Nevertheless, the data collected proved useful in understanding the scale of the problem – £236 million stolen from over 42,000 victims in 2017, with banks only being able to recover 26% of the losses. This revelation led to Parliament asking difficult questions of the PSR. The PSR’s alternative to holding banks liable for push payment fraud is for victims to be reimbursed if they can demonstrate they have acted with an appropriate level of care and that the bank has not. The precise definition of each level of care was a subject of consultation, and will now be decided by a steering group consisting of representatives of the banking industry and consumers. In my response to this consultation, I explained my reasons for recommending that banks be liable for fraud, including that fairly deciding whether customers met a level of care is a process fraught with difficulties. This is particularly the case due to the inequality in power between a bank and its customer, and that taking a banking dispute to court is ruinously expensive for most people since the option of customers spreading the cost through collective actions was removed from the Financial Services Act. More generally, banks – as the designers of payment systems and having real-world understanding of their use – have the greatest capacity to mitigate the risks these systems introduce. Nevertheless, if the rules for the reimbursement scheme are set up well, it would be a substantial improvement over the current situation. On the other hand, if the process is bad then it could entrench the worst of current practices. Because the PSR has decided that reimbursement should depend on compliance to a level of care, my response also included what should be the process for defining these levels, and for adjudicating disputes. Continue reading Will new UK rules reduce the harm of push-payment fraud? Posted on 2018-06-28 2018-06-28 Author Steven J. MurdochCategories Authentication, Banking security, Cyber crime, Legal issues, Public policy, Security economics, Security usability2 Comments on Will new UK rules reduce the harm of push-payment fraud? The EFAIL vulnerability in the OpenPGP and S/MIME secure email systems, publicly disclosed yesterday, allows an eavesdropper to obtain the contents of encrypted messages. There’s been a lot of finger-pointing as to which particular bit of software is to blame, but that’s mostly irrelevant to the people who need secure email. The end result is that users of encrypted email, who wanted formatting better than what a mechanical typewriter could offer, were likely at risk. One of the methods to exploit EFAIL relied on the section of the email standard that allows messages to be in multiple parts (e.g. the body of the message and one or more attachments) – known as MIME (Multipurpose Internet Mail Extensions). The authors of the EFAIL paper used the interaction between MIME and the encryption standard (OpenPGP or S/MIME as appropriate) to cause the email client to leak the decrypted contents of a message. However, not only can MIME be used to compromise the secrecy of messages, but it can also be used to tamper with digitally-signed messages in a way that would be difficult if not impossible for the average person to detect. I doubt I was the first person to discover this, and I reported it as a bug 5 years ago, but it still seems possible to exploit and I haven’t found a proper description, so this blog post summarises the issue. The problem arises because it is possible to have a multi-part email where some parts are signed and some are not. Email clients could have adopted the fail-safe option of considering such a mixed message to be malformed and therefore treated as unsigned or as having an invalid signature. There’s also the fail-open option where the message is considered signed and both the signed and unsigned parts are displayed. The email clients I looked at (Enigmail with Mozilla Thunderbird, and GPGTools with Apple Mail) opt for a variant of the fail-open approach and thus allow emails to be tampered with while keeping their status as being digitally signed. Should you phish your own employees? No. Please don’t. It does little for security but harms productivity (because staff spend ages pondering emails, and not answering legitimate ones), upsets staff and destroys trust within an organisation. Phishing is one of the more common ways by which criminals gain access to companies’ passwords and other security credentials. The criminal sends a fake email to trick employees into opening a malware-containing attachment, clicking on a link to a malicious website that solicits passwords, or carrying out a dangerous action like transferring funds to the wrong person. If the attack is successful, criminals could impersonate staff, gain access to confidential information, steal money, or disrupt systems. It’s therefore understandable that companies want to block phishing attacks. Perimeter protection, such as blocking suspicious emails, can never be 100% accurate. Therefore companies often tell employees not to click on links or open attachments in suspicious emails. The problem with this advice is that it conflicts with how technology works and employees getting their job done. Links are meant to be clicked on, attachments are meant to be opened. For many employees their job consists almost entirely of opening attachments from strangers, and clicking on links in emails. Even a moderately well targeted phishing email will almost certainly succeed in getting some employees to click on it. Companies try to deal with this problem through more aggressive training, particularly sending out mock phishing emails that exhibit some of the characteristics of phishing emails but actually come from the IT staff at the company. The company then records which employees click on the link in the email, open the attachment, or provide passwords to a fake website, as appropriate. The problem is that mock-phishing causes more harm than good. What harm does mock-phishing cause? I hope no company would publicly name and shame employees that open mock-phishing emails, but effectively telling your staff that they failed a test and need remedial training will make them feel ashamed despite best intentions. If, as often recommended, employees who repeatedly open mock-phishing emails will even be subject to disciplinary procedures, not only will mock phishing lead to stress and consequent loss of productivity, but it will make it less likely that employees will report when they have clicked on a real phishing email. Alienating your employees in this way is really the last thing a company should do if it wants to be secure – something Adams & Sasse pointed out as early as 1999. It is extremely important that companies learn when a phishing email has been opened, because there is a lot that can be done to prevent or limit harm. Contrary to popular belief, attacks don’t generally happen “at the speed of light” (it took three weeks for the Target hackers to steal data, from the point of the initial breach). Promptly cleaning potentially infected computers, revoking compromised credentials, and analysing network logs, is extremely effective, but works only if employees feel that they are on the same side as IT staff. More generally, mock-phishing conflicts with and harms the trust relationship between the company and employees (because the company is continually probing them for weakness) and between employees (because mock-phishing normally impersonates fellow employees). Kirlappos and Sasse showed that trust is essential for maintaining employee satisfaction and for creating organisational resilience, including ability to comply with security policies. If unchecked, prolonged resentment within organisation achieves exactly the opposite – it increases the risk of insider attacks, which in the vast majority of cases start with disgruntlement. There are however ways to achieve the same goals as mock phishing without the resulting harm. Companies are right to want to understand how vulnerable they are to attack, and mock-phishing seems to offer this. One problem however is that the likelihood of opening a phishing email depends mainly on how well it is written, and so mock-phishing campaigns tell you more about the campaign than the organisation. Instead, because every organisation inevitably receives many phishing emails, companies don’t need to send out their own. Use “genuine” phishing emails to collect the data needed, but be careful not to deter reporting. Realistically, however, phishing emails are going to be opened regardless of what steps are taken (short of cutting off Internet email completely). So organisations’ security strategy should accommodate this. Following mock-phishing with training seems like the perfect time to get employees’ attention, but is this actually an ineffective way to reduce an organisations’ vulnerability to phishing. Caputo et. al tried this out and found that training had no significant effect, regardless of how it was phrased (using the latest nudging techniques from behavioural economists, an idea many security practitioners find very attractive). In this study, the organisation’s help desk staff was overwhelmed by calls from panicked employees – and when told it was a “training exercise”, many expressed frustration and resentment towards the security staff that had tricked them. Even if phishing prevention training could be made to work, because the activity of opening a malicious email is so close to what people do as part of their job, it would disrupt business by causing employees to delete legitimate email or spend too long deciding whether to open them. A strong, unambiguous, and reliable cue that distinguishes phishing emails from legitimate ones would help, but until we have secure end-to-end encrypted and authenticated email, this isn’t possible. We are left with the task of designing security systems accepting that some phishing emails will be opened, rather than pretending they won’t be and blaming breaches on employees that fail to meet an unachievable bar. If employees are consistently being told that their behaviour is not good enough but not being given realistic and actionable advice on how to do better, it creates learned helplessness, with all the negative psychological consequences. Something must be done to protect the company; mock-phishing is something, therefore must must be done. This perverse logic is the root cause of much poor security, where organisations think they must comply with so-called “best practice” – seldom more than out-of-date folk tradition – or face penalties when there is a breach. It’s for this reason that bad security guidance persists long after it has been shown to be ineffective, such as password complexity rules. Compliance culture, where rules are blindly followed without there being evidence of effectiveness, is one of the worst reasons to adopt a security practice. We need more research on how to develop technology that is secure and that supports an organisation’s overall goals. We know that mock-phishing is not effective, but what’s the right combination of security advice and technology that will give adequate protection, and how do we adapt these to the unique situation of each company? When the CIO of a merchant bank found that mock phishing caused much anger and resentment from highly paid traders, but no reduction in clicking on links, he started to listen to what it looked like from their side. “Your security specialists can’t tell if it is a phishing email or not – why are you expecting me to be able to do that?” After seeing the problem from their perspective, he added a button to the corporate mail client labeled “I’m not sure” instead, and asked staff to use the button to forward emails they were not sure about to the security department. The security department then let the employee know, plus list all identified malicious emails on a web site employees could check before forwarding emails. Clicking on phishing links dropped to virtually zero – plus staff started talking to each other about phishing emails they had seen, and what the attacker was trying to do. Security should deal with the problems that actually face the company; preventing phishing wouldn’t have stopped recent ransomware attacks. Assuming phishing is a concern then, where possible to do so with adequate accuracy, phishing emails should be blocked. Some will get through, but with well engineered and promptly patched systems, harm can be limited. Phishing-resistant authentication credentials, such as FIDO U2F, means that stolen passwords are worthless. Common processes should be designed so that the easy option is the secure one, giving people time to think carefully about whether a request for an exception is legitimate. Finally, if malware does get onto company computers, compartmentalisation will limit damage, effective monitoring facilitates detection, and good backups allow rapid recovery. An earlier version of this article was previously published by the New Statesman. Posted on 2017-08-22 2017-08-22 Author Steven J. Murdoch, Author Angela SasseCategories Authentication, Education, Internet security, Malware, Public policy, Security usability4 Comments on Should you phish your own employees?